Awards for 2, 5 and 10 crossings were first awarded in 1977. The badges were green for 2 crossings and red and black for 5 and 10 crossings respectively. 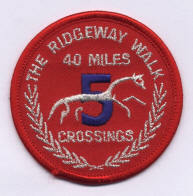 The badges were tin pin badges but they just said 'Ridgeway Walk 40 miles' on them. 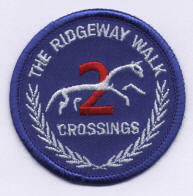 Also in 2008 the 15 crossings badge, was introduced. 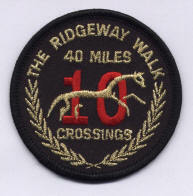 The Ridgeway40 badge is available for purchase by all participants who complete the 40 mile walk. 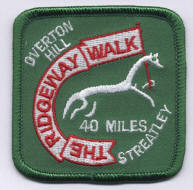 Pedometer carried by a Ridgeway40 walker showing a total of 78,284 steps!